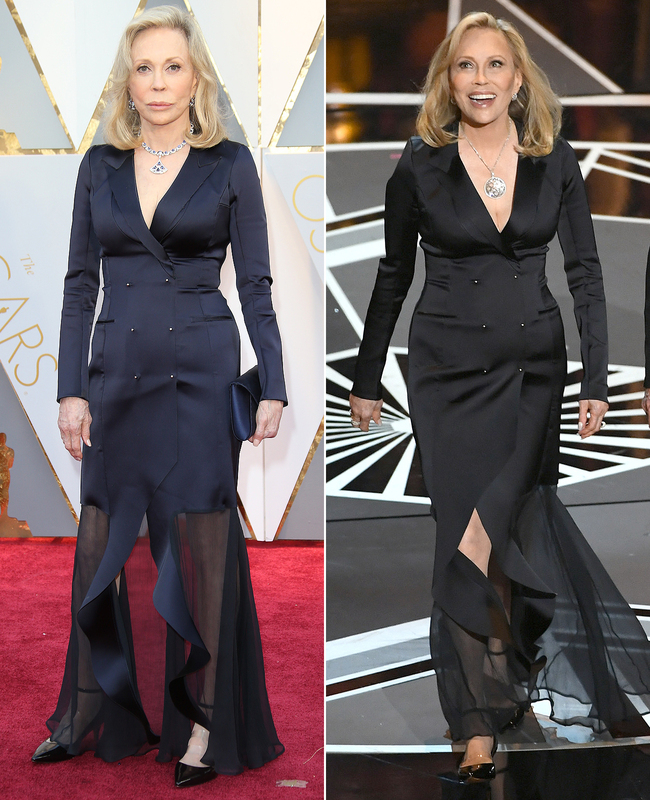 Faye Dunaway Rewears Her 2017 Oscars Dress to Present Best Picture at the 2018 Academy Awards - Integration Through Media ....! After Faye Dunaway and Warren Beatty famously announced the wrong Best Picture winner at the 2017 Academy Awards (leading the envelope gate), the two got a do-over at this year’s ceremony. And Dunaway took her responsibility very seriously, when she arrived wearing the same dress as last year! The 77-year-old actress took the stage wearing the same Esteban Cortazar dress featuring a double-breasted tuxedo up top, and ruffled, sheer gown on the bottom, which she was first seen wearing on the 2017 Oscars red carpet. Before the now-infamous winner mix-up last year, she swapped outfits changing into a long-sleeve white Atelier Prabal Gurung gown with shoulder cutout detailing. “She loves and understands young designers like @ecortazar who made this for her based on a look from his upcoming show,” Stewart wrote. This marks the second notable rewear of the night when Tiffany Haddish recycled her white Alexander McQueen gown (that she bought herself) to wear on stage to present. She previously wore her designer gown to the Girls Trip premiere and to host SNL last year and helped to dispel the stigma around rewearing the same outfit during her SNL monologue. “I feel like I should be able to wear what I want, when I want, no matter how many times I want, as long as I Febreezed it,” she joked on the show.